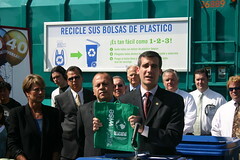 I joined Councilmember Ed Reyes and Assemblymember Lloyd Levine to kick off Los Angeles' new plastic bag recycling program. Thanks to Assemblymember Levine's legislation, all stores greater than 10,000 square feet will soon have on-site plastic bag collection centers where you can bring your bags to be recycled. Councilmember Reyes has gone beyond this threshold, working with smaller local grocery stores to provide the same service to a wider audience. To make recycling even easier, the city’s blue bin program now accepts plastic bags and coat hangers. Couple this with the expansion of the blue bins to multi-family residences in the city and recycling is easier than ever. Each year, Californians consume 19 billion plastic bags - an average of 552 bags per person. These bags consume 82 million gallons of oil per year, increasing our dependence on fossil fuels while emitting tons of carbon dioxide into the atmosphere. Once the bags have been put to use they often end up in our watershed, polluting the LA River and the Santa Monica Bay and disrupting our fragile marine ecosystems. A ubiquitous feature of modern life, plastic bags have had a tremendous impact on the environment. These new programs represent an enormous opportunity for us to reduce our ecological footprint. Recycling is only one part of the equation. We need to reduce our consumption - for instance, by employing canvass bags like the one featured here - and reuse plastic bags when possible. Recycling is a small thing, but it is those very small changes we commit ourselves to, whether using an energy efficient Compact Fluorescent Lightbulb instead of a regular light or taking public transit once a week, that will preserve our planet for future generations. Sustainable living is not a privilege for the wealthy — all of Los Angeles wants to go green. That's why the city has partnered with Enterprise, one of the nation’s top affordable housing developers, to bring funding and technical assistance to affordable housing developments in Los Angeles that commit to including sustainable practices and technologies in their developments. 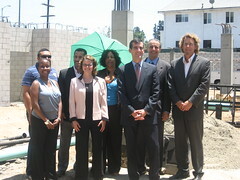 A part of the national Green Communities Program, a $555 million effort on behalf of Enterprise to green affordable housing across the country, the Los Angeles Green Communities Program will provide $300,000 and expert advice to four projects in the city — Bronson Court in Hollywood and Seven Maples in Westlake developed by LA Housing Partnership, Hyde Park in South LA developed by Enterprise Home Ownership Program, and Rittenhouse Square also in South LA developed by Rittenhouse Limited Partnership. Combined, these four developments will bring the benefits of green building to more than 200 units of affordable housing in the city. They will feature solar panels and solar water heaters, along with a wide range of sustainability features built into the construction process. It would be a mistake to think that the benefits of these features — including lower water and electricity bills, open space, and better indoor air quality — can only be realized by the rich. We can't allow the dream of owning a house to fall completely out of the reach of middle-income residents, and we must not let the market for sustainable living and sustainable products has be cornered by those who can afford to pay for it. The Green Communities Program will bring the dream of owning a house and the dream of green living together, and shows the way to an affordable and sustainable future for Los Angeles. Another significant difference between New York and Los Angeles: available shelters. An NYC ordinance dating back to the 1980s requires that the city provide a bed for every single homeless person. It's estimated that 35,000 New Yorkers sleep in shelters every night. By comparison, Los Angeles County has only an estimated 17,000 shelter beds to serve the 90,000 homeless living in its entire county. I joined several department general managers—Gail Goldberg from Planning, Andrew Adelman from Building and Safety, Dee Allen from Environmental Affairs, Commissioner Paula Daniels of Public Works and Department of Water and Power Commission President David Nahai—and dozens of developers, builders, and environmental advocates as the city unveiled its green building proposal. Developed in partnership with non-profit Global Green, the legislation would fundamentally transform the city's built environment. As I noted in my post on DO REAL PLANNING principle # 7 (Produce Green Buildings), buildings consume 36% of our total energy, account for 30% of our greenhouse gas emissions, and use up 40% of raw materials worldwide. We’re asking more from developers, but at the same time, we’re demanding much more from ourselves. Our new proposal includes a new environmental baseline for building in the city, including a requirement that all buildings greater than 50,000 square feet or more than 50 units of housing be LEED Certified compliant. This requirement is matched by a city commitment to educate its staff about green building to handle the new baseline, and to provide public education and outreach on green building. Finally, the city is offering new incentives: expedited processing, financial grants, and technical assistance for developers and builders that chose to achieve an even higher level of sustainable building. As a city, greening our buildings is the strongest tool we have at our disposal in the fight against global warming. In terms of global greenhouse gas (GHGs) production, buildings account for roughly the same percentage of GHGs as cars do, even though the burgeoning national consciousness has had disproportionately more focus on tailpipe emissions and MPG efficiency. While our counterparts at the state and federal level pursue higher emission standards for automobiles, Los Angeles is taking the lead in developing local solutions to a global crisis. Buildings are the prism through which we can see many of the environmental issues that affect all communities - from greenhouse gas emissions to landfilling to urban runoff. Making it easier to build green in Los Angeles will help us all reduce our ecological footprint. How're you going to keep them down in the Beltway after they've seen old L.A.? Reverend Jeff Carr is back. Yes, that Jeff Carr: the one who ran the Bresee Foundation in East Hollywood where we built the Bimini Slough, our first eco-park; the same Jeff Carr who, after an emotional sendoff (see picture) packed his family in an R.V. to see America and wound up in Washington D.C. as the chief operating officer of Sojourners, mixing religion, social justice and national politics. 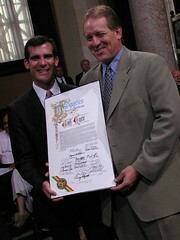 Mayor Villaraigosa has appointed Rev. Carr to be his Deputy Mayor for Youth Development and Gang Prevention. I'm glad he's back in town. His job won't be easy, but having worked closely with him in CD13, I'm glad he's going to be doing it. One of the heartbreaking paradoxes of the city we live in is that while crime has plummeted to a rate unseen since well before I was born, youth homicide remains unaffected. At the same time as Connie Rice's city-funded study came out, the council created the Ad Hoc Committee on Gangs; adding this appointment by the mayor, we're reaching the kind of critical attention that will hopefully allow us to break this cycle. Good luck, Jeff. Following the success of the Hollywood Walkabout last year, I joined community members and urban planners alike for the Glassell Park and Cypress Park Walkabout, the first step in identifying opportunities to improve walkability and create a community-centered design plan for these two neighborhoods. We measured sidewalks, surveyed the different types of development in the community, and began identifying beautification measures, both within the community and sections that connect to the LA River Master Plan. First among the 14 points identified in the Planning Department’s DO REAL PLANNING agenda is Demand Walkability, and communities such as Hollywood and Glassell Park are getting in on the act by bringing neighbors and planners together to discuss their vision for the future of their area. 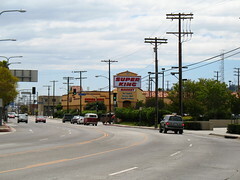 (And some parts of the area are much more walkable than the part in the picture above--though that is all too typical of Los Angeles's commercial corridors.) The Walkabout was a great first step towards a sustainable, community based vision for the future of Glassell and Cypress Park. A couple of years ago, the Los Angeles Public Library produced at my office's request a Firefox search engine allowing LAPL users to look for books from their browser search windows. It's been updated for Firefox 2.0 with title, author and keyword searches and can be installed directly from the mycroft search engine library. Check it out! The conversation about the future of our cityscape that I joined with my Do Real Planning series continues to gather steam. The Los Angeles Business Journal printed an opinion piece (free registration required) that I wrote about how recent developments in Hollywood crystallize the points laid out in the Planning Department's manifesto (.pdf version available here). The LA Weekly recently published a provocative cover story arguing, among other things, that the term "smart growth" is being used to cover for the same old "dumb growth" that our city can't afford to keep seeing. Today, the Police Commission approved a report advancing my initiative (.pdf) to allow individuals to snap a cameraphone picture of a crime or accident scene and send it to law-enforcement officials over the 911 system. It's an exciting prospect, covered at length in today's Daily News. Los Angeles can be a leader in the use of technology to improve public safety. LAPD Commander Charlie Beck, who I worked with closely to install security cameras in various crime hot-spots in my district, once shared with me the importance of putting police radios in patrol cars - allowing police to go from call to call without cumbersome treks back to the station house. We've come a long way since those pre-radio days, but we should be bold in adopting new technologies to help make our neighborhoods after. Once we perfect technical issues, from system capacity to the quality of images sent, we can look at exploring other non-emergency uses of this technology that are compatible with the the City's 311 "One Call to City Hall" system: Here's that abandoned couch on the street I want to report...and fill this pothole too! The LAFD issued a report that raised some issues with the proposal, but I know that we can work together to address some technical issues to integrate the software with the 911 system in a way that doesn't hold up our updates, or interfere in anyway with standard 911 phone calls. The e-news has gone out, with announcements on Planning 102, next Wednesday's hearing on Instant Runoff Voting and other electoral reforms, and more. Read it here or subscribe here and have it delivered right to your inbox. CD13.com readers may remember my trip to Beirut last year that resulted in a Sister Cities agreement between Beirut and Los Angeles. 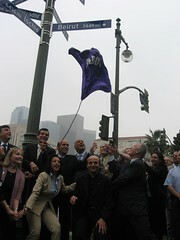 Now the Sister Cities pole at the corner of First and Main bears the name of one more city, our Sister in Lebanon. Special thanks to my Lebanese-American friends Councilmember Dennis Zine and Ferris Wehbe for helping make it all happen. Already home to the nation's only World War II Filipino Veterans Memorial and an enormously popular skate park, Lake Street Park now boasts a state-of-the-art 6800 square foot gym, complete with a full-length basketball court, retractable backboards, and an electronic scoreboard to boot. 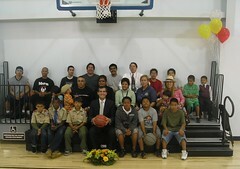 My staff and I joined local youth to break in the court with the Lake Street Gym’s inaugural pick-up basketball game, the first of many. The lack of recreational space in Los Angeles has been well documented (check out today's LA Times), and Lake Street gives people young and old a place to skate, play ball, and enjoy open space in one of the most densely populated areas of the city.